I am one of those purchasers that are always wary of what I might be letting myself in for when buying “Off the plans” so to speak. I have made several purchases of Mr Hornby’s products and also SCX’s but these are pretty well backed up by the knowledge of the previous product and the unlikelihood of the items in question being worse than previous similar offerings. The point I am making is that Carrera’s Evolution products do not rank highly in my esteem because of previous experience, that is until now! I have two or three of their earlier products, purchased for various reasons. There is a Bentley EXP Speed 8, purchased for possible sentimental reasons. Bentley (even though they are now just a badge under the auspices of VAG) epitomise one of the earliest British attempts and successes at International Motor Sport in the 24 heures du Mans of the 30’s. 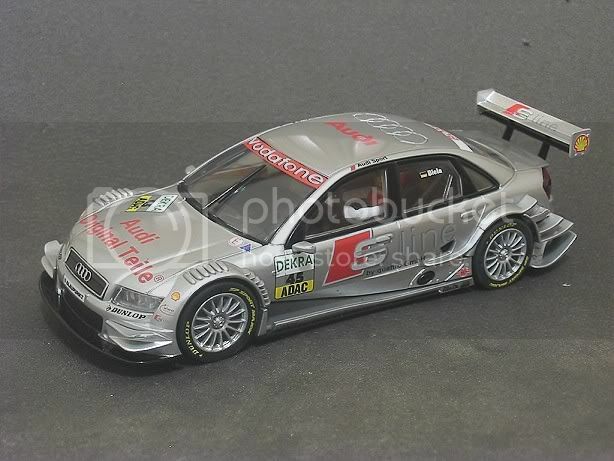 The model itself is a spectacular rendition of the VAG team entry 2001. The model is also cripplingly overgeared, firstly by an unrealistic final drive ratio and then by the huge diameter rear wheels and tyres! This car requires a track with three metre radius curves and ten metre straights! I have the 1953 Mille Miglia Aston Martin DB3 purchased with the intention of contesting a classic sports car class. Again a massive overgearing project which was partly tamed by fitting a Ninco 24z axle and a Cartrix large dia 8z pinion! Unfortunately the driver and navigator both look like they’ve never been to the lav in their lives and are due to go. Also, the large front grille looks like it has been punched out of a sardine tin with a square wad punch! Then there is the 1955 Mille Miglia Mercedes Benz of Mr Moss and ‘Jenks’ Jenkins purchased locally solely because it appealed to me. I have to say that this is a lot better model but still dogged with gearing problems and poor driver depiction. These are open sports cars where the drivers are quite prominent. Rob has done some excellent reviews on some of their other models. The F1 Ferrari being an outstanding example and the Muscle Car shootout being a good positive review (Check out these reviews in this section). So, as Rob has not been one to fantasize, I have bitten the bullet and bought this car in a UK ‘Buy it now’ auction, less VAT of course! It was purchased for the equivalent of $60.00 which included airmail postage to Aus. Well! Disappoint ! IT DOES NOT! On opening the parcel this car positively gleamed at me from it’s mirror backed display case! A beautiful pale silver with typically restrained German advertising spattered across it. 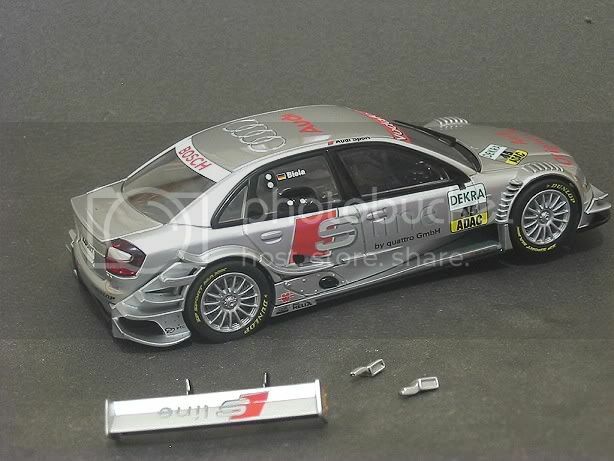 The model is a copy of the 2004 Audi Sport Infineon Team Joest A4 as driven by Internationally famous Frank Biela. 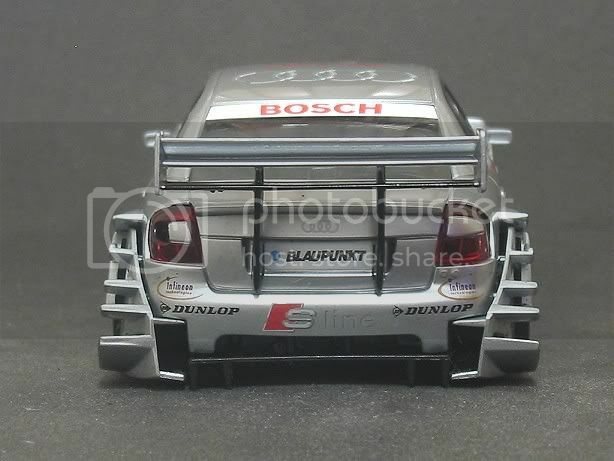 The tampo as we have come to expect on a lot of slot cars is first class. Once again the makers have even included barely legible print which shows up as clear as day under the magnifier! The body bristles with fins and vents. Front and rear are heat welded to the main body moulding and I suspect could be vulnerable if crashed heavily too often. The front grilles are a far cry from the Aston Martin DB3 with the grille matrix barely discernable to the naked eye. Side vents and exhausts too are crisp and well defined. The right side window carries realistic service ports for fuel etc. The lights are the LED/ Xenon type (I think) They illuminate brightly from the first application of power, no matter how little, and they stay bright all through the power range but they do extinguish when there is no power. The next item I give Carrera 11 out of 10 for! They have made the rear wing and the door mirrors detachable, yes, they have! Any self respecting racer will want his car primarily to perform on the track but how many of us look, with a little bit of despair at the end of a race, at our prize DTM, GT1, Rally car and find that one shunt too many caused the rear wing and/or door mirrors to be permanently ripped from the carcase of one of their babies! Well with this beauty, you can take them off before the start of the Demolition Derby. Both the rear wing and the door mirrors are a wedge fit into the body and will detach without harm to either. When in place they will stay put for the duration! The wheels are actually a solid moulding. They have a mock brake disc behind the spokes which is part of the rear of the wheel rim giving a strong bearing for the tyres. Underneath the car are more goodies to tempt and tantalise as well as a couple of downers. First plus, we can see the trusty Carrera sliding magnet, this is normal fare and contribute moderately to the front end stability, There is a very good rear magnet mounted between the motor and the axle. 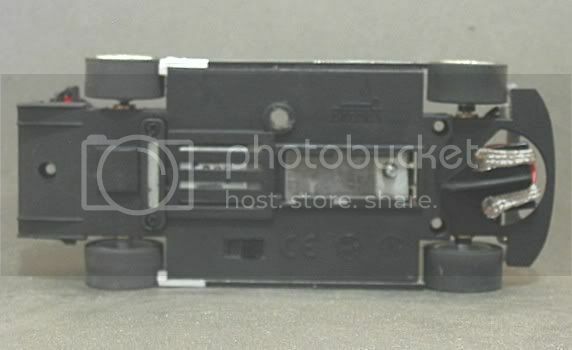 This is reminiscent of an SCX set up but to adjust the height of this you will need to detach the magnet holder and fit the long shim supplied with the spare braids in the little compartment in the back of the display case. Second plus is that the body is only held by three screws. With the single screw at the rear. The minus’s, firstly and most obviously! The Carrera guide!!! Please Mr Carrera, I can understand that a lot of your market runs on Carrera track where this guide is at home and some run on board tracks were this is not a hindrance, but there is also a massive home track/local cub clientele that find this guide an abomination! Sorry if I’m too emotional. I’m not asking to have the guide removed but for export markets it would be prudent to supply a more standard guide as an ‘in box’ extra. For the sake of 50 cents?! 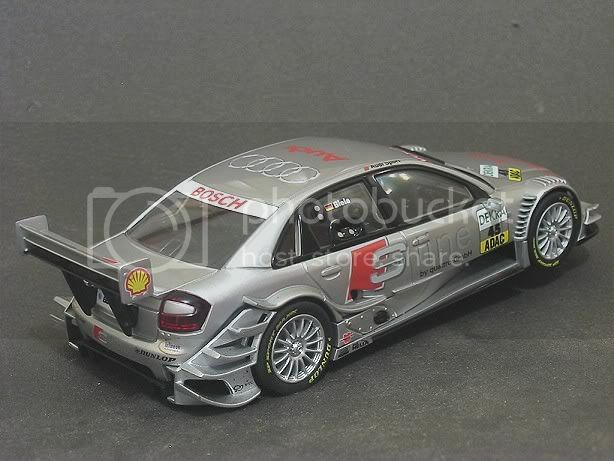 Other than that, the bottom of the car is a regular flat base and Carrera have managed to get the model down to a low stance as per the real thing. OK, let’s open her up! Easier said than done! Well, after the removal of the screws I half expected the chassis to fall into the palm of my upturned hand! WRONG! Even after a bit of judicious tugging and wangling I still couldn’t see inside. A note of caution. The inside of this model is VERY BUSY (see pic) Although it only has three fixing screws, it has a hundred and one booby traps! The front lights need to curl into the nose section of the body and the rear lights mounted on the chassis are WIDER than the rear body opening! After several attempts I got the model apart and WOW! It’s a mass (comparatively) of wires and resistors and diodes and... well, it looks as full as an old 386 computer I once owned! The side panels are mounted to the chassis as are the front and rear light modules. 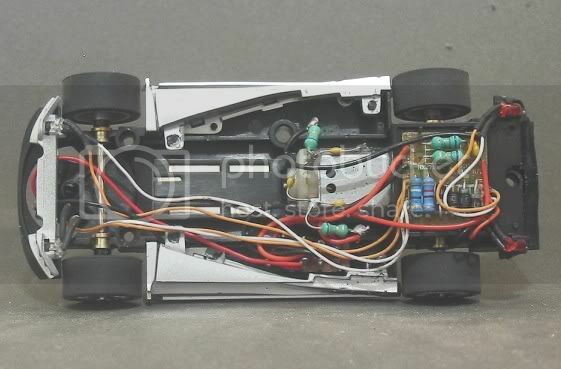 The light control board is mounted on four rather slim pins on the chassis. This completely masks the rear axle and care is needed when removing and replacing this board to minimise damage to the pins. Always make sure this board is firmly in place before trying to remount the body! The motor has the usual array of TV interference goodies, shunt and capacitors liberally spread about the motor looking like an electronic spider has ensnared it in its componentry web! Front axle runs in stout brass bushes but still there is a lot of slop in them? Rear axle too has brass bushes with an equal amount of slop. The Motor is the usual ‘S’ can. I don’t know Carrera motor specs but it seems to be like the Revell motor. About 21,000 rpm. The pinion is like the Scalextric reinforced 9z plastic pinion and the crownwheel is a natural finish 27z. The rear end mesh wasn’t as close as some and the teeth on the crownwheel looked a bit undersize to me and it’s reliability has yet to be proved. So to racing. Firstly, while the body was off I took the opportunity to touch up the wheel concentricity. They weren’t far out but the right hand rear had a bit of a wobble in it. Tyres refitted, I then coaxed the body back on, sliding the body over the rear lights first and then wangling the front lights into place while guiding the body mounting pins into their recess’s on the chassis!! Pheeeww! First outing was the red lane of my local 21.5 metre board track. Computer on and lap counters geared up. I take it for a mid speed saunter. First impression? Quiet! Very quiet! Very pleasing. Noise is wasted energy and this model isn’t wasting much! Second impression was the way the car squats on the track, Very realistic. So, two nil up I start to open up. Still quiet, still stuck to the track. Start to push it a bit in the corners, braking early and powering round, yes, I like it. Next was a dozen laps hitting the corners harder and powering up half way round the bend. This is when the model’s out of the box (SOOB) limits start to show. The back end start to break away, still under control but a little early I thought. Testing continued until the car slid sideways out of the bend. I then tried driving hard into the corners ‘til deslot occurred. This model demonstrated a ‘drive on’ (understeer) deslot where it eventually carries straight on as if there were no guide as opposed to some models which tip. This is invariably caused by a lighter front end or tilting guide. The best time I could achieve without demonstrating ‘ragged edge’ driving was a lap of 7.2 secs (Body tuned NC1’s will do this on this track) so a few minutes on the bench were called for. First job was to sand the rear tyres. Another dozen laps show the fastest time to have dropped to 6.7 secs. Again just inside the comfort zone. Cornering having improved noticeably. Next was the standard race prep treatment. Tyres were massaged with silicone lubricant (WD40) and dried off. Body screws were backed off ‘til a degree of body movement was achieved. Because of the way Carrera mount their bodies to the chassis and because of the onboard hardware it is hard to get that free movement I like to see in a body. Back to the track, A couple of warm ups and off we go. With the tyres cleaned and screws loosened we managed a best lap of 6.334 secs. Not shabby for a DTM on wood but not cutting edge. The car still had a tendency to drive on if I attacked the corners but the power on in the bends was respectable. The car holding its line and exiting from bends very convincingly. I finished the testing on wood at this as it was obvious that attention would need to be paid to the front end problem. Out of interest I weighed the front and rear downforce. The guide carries 35 grams of total vehicle weight and the rear wheels carry 70 grams of the total weight of 105 grams (F 33%, R 67%)! By comparison, the new SCX Vectra carries 53 of its 90 gms on the rear wheels and 37 gms on the front (F 41%, R 59%) and is quiet respectably quick in and out of corners on wood. So, this afternoon I’ve been to a First class ‘New track’ inaugural race meeting for the Four Seasons SCC and I took the opportunity to put the Audi through its paces before racing began. This is a four lane Classic Scalex track with VRS timing. We haven’t calculated the lap length yet but we estimate it to be about 30 metres plus. With one long straight past the controller stands for the length of the table. Running it as always a bit at a time I worked up to what I felt was the cars upper limits. Fast on the straight but not blindingly. Fly and Scalex cars would probably have the edge in a straight line! Cornering, even with the front magnet right forward the car still showed a tendency to be light on the front and understeering came too often for my liking. Speed out of corners was also limited by an impromptu slide. I can only attribute this characteristic on both wood and plastic to the overly heavy rear end which is surely exacerbated by the mounting of the lights circuitry OVER the rear axle, increasing the weight and the pendulum effect of the tail of the model! The addition of the extra magnet shims would go a long way to fixing plastic track handling. The lack of straight line speed also concerned me, on looking further I noted that if the reverse switch mounted under the car (Carrera standard) was flicked the motor revved a lot harder in that direction and during a short lull in practice I managed a couple of laps in reverse direction round the track. Sure enough, the motor has extra oomph when racing anticlockwise. I won’t go into the whys and wherefores in this review but surfice it to say that a possible com. timing variance may be the cause of this. On looking inside there is plenty of room to reverse the axle in its mounts. This will allow me to run the model in a clockwise (standard way) manner with the motor working at peak. Drive train, Fair, I’m concerned that the motor runs harder one way than the other , This is not an ‘S’ can attribute and may be a defect with just this motor, I like the brass axle bushes but am concerned about the longevity of the crownwheel! Handling, MMMMMMM! I feel it is potentially good with a bit of work but out of the box it is left wanting. Trying to balance the front/rear weight discrepancy by adding weight would be counter productive, For me there has to be another solution without sacrificing the lights! I would also probably put a Ninco guide in for plastic track racing. Front Axle width			58.5 m.m. Rear Axle Width				58.5 m.m. Rear tyre diameter  			21.0 m.m. 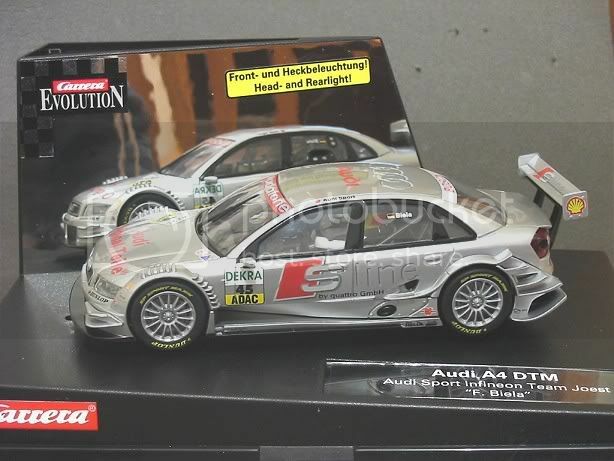 Once again a model I may never part with but It has a long way to go before it will contend the DTM class at my local tracks. Along with a couple of other models Carrera have recently produced, this is a warning shot across Fly, Scalex and others bows. ‘Til now, Carreras have to me been more a curiosity, but this has changed everything. 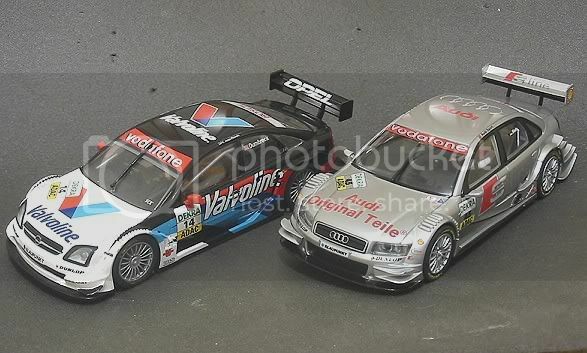 If you love DTM go and buy this car. In my view on wood it is fixable and can be competitive without major expense. On plastic it may require the lights to be disconnected and the control board removed to shift the balance point forward. It will be asking a lot for the magnet to do all the work. And the spoiler is detachable!! !